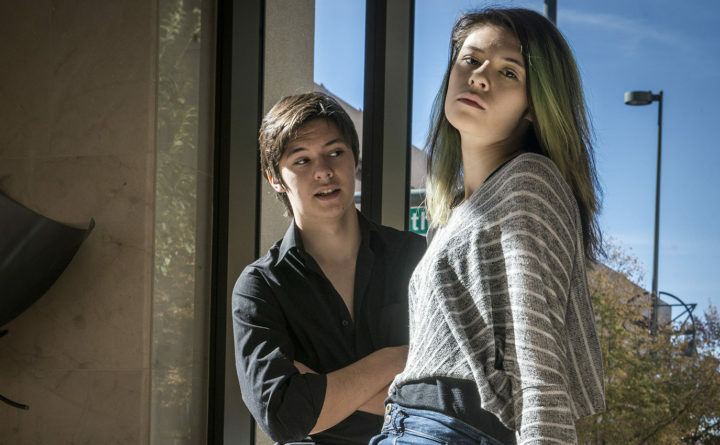 Nicole Maines, left, and her twin brother, Jonas, are photographed in Denver, Oct. 10, 2015. Nicole Maines will make her big screen debut in the indie vampire film "Bit." PORTLAND, Maine — A transgender former middle school student who fought to use the bathroom of her choice in Maine is preparing for her big screen debut. Nicole Maines is starring in the indie horror film “Bit” as a transgender teen trying to co-exist with and understand a group of feminist vampires in Los Angeles. Maines has been attending the University of Maine in Orono but her father tells the Portland Press Herald that she’s leaving to focus on acting. The 20-year-old made her TV acting debut three years ago in the USA Network series “Royal Pains.” She’s also appeared in documentaries as herself. The state supreme court ruled in 2014 that her rights were violated when school officials would not allow the transgender fifth-grader to use the girls’ bathroom.